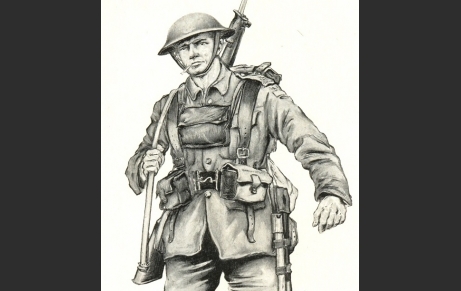 Drawing of DLI soldier in July 1916 by Adrian Hill. From West Hartlepool, served with 18 DLI (Durham Pals), interviewed by the IWM. No County Durham Great War veteran is alive today. However, the voices of some of these men live on thanks to recordings made by the Imperial War Museum last century. Today these recordings may be heard on the IWM’s website, and, though the voices and memories are often faltering, together these old soldiers allow us a glimpse of what it was really like when County Durham went to war a hundred years ago. Frank Raine was one of the veterans interviewed by the Imperial War Museum. He was interviewed by Peter Hart in 1987. Born in West Hartlepool in November 1895, Frank Raine was working as an invoice clerk in a steelworks, when the First World War began. Keen to volunteer for the Durham Pals, Frank’s interview captures the eagerness, spirit and naivety of so many young men in August 1914, as he describes how, after first being rejected as being too short and slight, he was finally accepted in September 1914 at a recruiting office in Spennymoor and joined ‘B’ Company 18th Battalion DLI. Private Raine did his basic military training at West Rainton and Cocken Hall, and he was in Hartlepool with a detachment of Durham Pals on coastal defence duty, when German warships shelled the town on 16 December 1914. After long months of training at Ripon and in Wiltshire, the 18 DLI sailed for Egypt, arriving in December 1915, just in time to ensure that the Pals were awarded the 1914-15 campaign star. Sea sickness, the threat of German U-boat attacks, and rumours of being sent to Gallipoli dominate Frank’s recollection of the long voyage. After a few months in Egypt, the Durham Pals were ordered to France, landing at Marseilles in March 1916. Frank then describes in great detail his early experience of the trenches on the Western Front, remembering the food and water, rum and cigarettes, parcels from home, lice and rats, plus the ever-present shelling and sniping – the daily routines of trench warfare. On 1 July 1916, the first day of the Battle of the Somme, the 18th Battalion DLI, as part of the 31st Division, was at the northern end of the battlefield, opposite the German trenches at Serre. After the failure of the division’s advance, three companies of Durham Pals, initially held in reserve, were ordered forward into the shattered remains of the British front line to repel any counter attack. In his interview, Frank Raine remembers climbing out of a trench, before being stunned by an exploding shell and wounded by a flying splinter. After seeking the safety of a shell hole, Frank was able to make his way back to the safety of a trench. After the Battle of the Somme, Frank Raine, promoted to Lance Corporal, continued to serve on the Western Front until 1918, when he was again wounded. When the war ended, Frank was recuperating in South Shields. After the war, Frank Raine returned home to Hartlepool. He died in 1996, aged 100 years. When he was interviewed, Frank Raine remembered having his photograph taken in uniform. Sadly there is no copy of this photo in Durham County Record Office. If you have a copy of this photo or, indeed, of any photo of Frank, either as a young or old man, please get in contact with us. Residence: 1911 Census: 5 Murray Street, West Hartlepool, County Durham. Invoice clerk in steelworks, 1911-1914. Family: 1911 Census: parents – Robert Raine, aged 41, cycle dealer, West Hartlepool & Margaret Isabella Raine, aged 39; siblings – William John, aged 16; Robert, aged 10; Arthur Jackson, aged 6; Ethel, aged 3; Margaret, aged 1. 18/355, Private (later Lance Corporal) Frank Raine, 18th (Durham Pals) Battalion DLI, 1914-1918.